This is something thats been 90% complete on my computer for about a month. But I couldn't decide on the background until now. 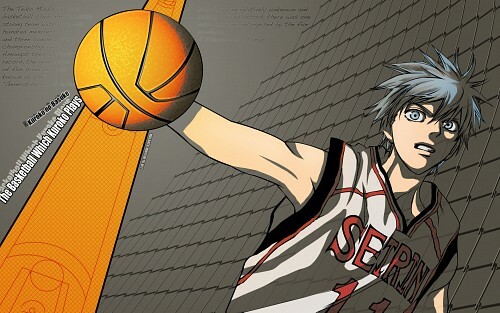 Kuroko was vectored from a scan, and originally the wall was all done in 7 colours. However this was scrapped when gradients where added since the 7 colour scheme just looked too plain. Kuroko has minimum shading (there is some, if you strain your eyes) while the basketball has some detailed shading. The background went through MANY changes and I still only consider it a 'pass'. The lines of the text (apart from the space filler anime introduction text), fence, and 'basketball court' all roughly point at the basketball to draw the eye towards it. The court lines over the orange where referenced from google as I have no knowledge of basketball. Don't blame me if they're wrong! I also made the fence pass through the shadows on Kuroko in an attempt to make him more invisible. I saw the original of this artwork from the manga. You did a good job vectoring it. I love the way you created the texture for the basketball. It's awesome. The black text in the background is not that necessary. It takes away from the dynamic of the main text that you have. You could either kill them or arrange them like you did with the main ones. Or you could use them as the motion line the same as in the original to create momentum/movement.